Since antiquity the whereabouts of the legendary island Atlantis has been discussed. From Plato to Francis Bacon and into today’s world, it has been a frequent topic for both scientific research and art. 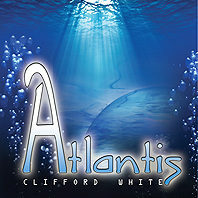 Atlantis is also the topic for an album by Clifford White, which was released in 2010. Here he gives the listener a fresh perspective on the old myth. Indeed, after 65 minutes of music you feel that Atlantis has risen from the ocean and become a place in your mind you can visit and revisit again and again. So hang on, and enjoy the voyage! Atlantis is a popular theme in New Age Music. Most prominent is David Arkenstone’s Atlantis: A Symphonic Journey (2004), but also Alex Herr’s synth classic from the late 1980s Atlantis Arising comes to mind. And now we can add another strong album to the list! I was excited when I heard that Clifford White’s new album would be about Atlantis. The reason is because his previous albums concerning water are among my all time favorites. The collection An Island Called Paradise is a like a trip to a magical and relaxing island, and I make sure to recommend it as often as I can. Selected songs from it are also among the most popular on our channel New Age Stars. We must also not forget that Clifford White is used to myths and great histories; The Gods Of Olympus (2009) was an album worthy of gods. I am fascinated by the way Clifford White changes sound from one track to the next, while the tracks still blend perfectly into each other. An example here is track 6, Time Tunnels, which is lounge in style. It has a jazzy freshness. Then it is track no. 7, Edge of the Ocean, which is laid back, has a bossa nova beat and a Vollenweider-ish electronic harp melody. This makes the album into an interesting listen. Sample the album on Clifford White’s homepage.